UPDATE (Dec. 13, 2016) – See below. The Weller WES51 is no longer recommended. I’ve always been an electronics experimenter – from the time I was in my teens. 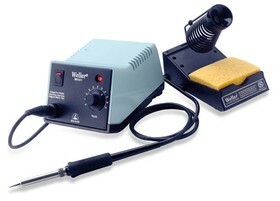 Back then, I used an old Weller soldering gun (literally unchanged for 40+ years! ), as well as a soldering pencil from Radio Shack. After working as an R&D designer and EMC engineer for my career in the industry, I inherited an old Weller soldering station that was being retired form HP, where I was working at the time. It worked well for several years, but the connector was worn out and I had to jiggle it often to make it heat the tip of the iron. I eventually decided to retire it for good and purchased a new soldering station from www.ifixit.com for the miserly sum of $25 on special (pictured below). What a mistake! The tip wouldn’t “take” solder very well and I had to crank the variable control all the way up to get adequate heat. But, the worst thing was the cord to the iron itself. It was so stiff and “non-flex”, it kept getting caught around the soldering stand. It was terrible! I “round-filed” it today. I then went back to the small Antex Precision soldering pencil – probably a brand you’ve never heard of, since the company is based in the UK. This is a great tool and the tips are small and replaceable. You can still order these off their web site at: www.antex.co.uk. Mine is an older Model D, but the equivalent is the 15W Model C15 for 17.45 pounds, or about 30 bucks. Make sure you get the 120V version! You’ll also need to buy a stand for the pencil. I still wished I had the Weller model with it’s replaceable tips (for which I had a goodly stock), so I “drove” over to Amazon and found just what the doctor ordered – the Weller Model WES51, which is a low-end industrial model with temperature-controlled tip and variable heat control. 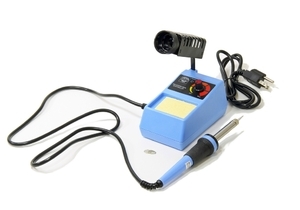 The price was just $86 and includes the temperature-controller and soldering stand. What I really appreciate is the range of tip sizes for the iron. Many are fine-tipped enough to work with surface-mount components. They cost around $4 each. The pencil itself is very light weight and easy to hold. One thing I don’t particularly care for is once the temperature has reached the desired setting, the LED lamp on the controller (upper right) starts blinking rapidly, so I may just tape over it. Recommended. UPDATE (Dec. 13, 2016) – The Weller WES51 is no longer recommended. After using this for a period of two years, I noticed it was starting to get flaky and had to keep turning up the tip heat. Eventually, it failed completely. After a Google search, I see that this has happened to several people. It seems the temperature sensor within the tip fails and this stops it from working. Unfortunately, there’s no easy way to open up the soldering pencil itself. Apparently, Weller sells a new “pencil” for about half the cost of the original unit (about $40). BUT, there’s no guaranty this wouldn’t occur again. I also found that when Weller was sold to another corporation, customer support went “belly up”. So I pitched the whole this into the “round file”. You’ve been warned! (12/14/16) I just received it today and it appears at least as good a quality as the Weller. Hopefully, it will be longer lasting. In the picture at Amazon, the cord seemed rather stiff-looking, but in reality, it’s pretty flexible. The soldering pencil cord plugs in with a six-pin round DIN connector that fit tightly – better than the floppy fit of the Weller plug. Turning the unit on using the side power switch started the digital display counting up to the default 750 degrees F. It only took about 30 seconds. The system includes the base controller and a soldering pencil holder with sponge and brass tip cleaner. Hakko makes a wide variety of replaceable tips. The one that comes with the kit is a general-purpose one that should suffice for most electronic circuit soldering jobs. I also purchased the T18-C05 tip, which is ultra-fine for surface mount components. I went for broke and ordered a set of blade-shaped tips for heavier duty use. These included the T18-S3, -D08, -D12, and -D32. Altogether, there are 29 available tip styles. One wish would be some sort of extra tip storage on the soldering pencil holder. The user interface leaves a lot to be desired and consists of only two non-intuitive buttons labeled “Up” and “Enter”. I would have preferred Up, Down, and Enter…or perhaps a simple knob as in the Weller. The temperature range is adjustable from 120 to 899 degrees F. Pressing the Enter button for one second allows you to change the temperature one digit at a time…and only in the up direction…sort of like a cheap digital clock. Continuously pressing the Up button will eventually recycle the digit back to “1”. Pressing Enter will step to the next digit, and so forth. There are also five preset temperatures, 600, 700, 750, 800, and 850 degrees F. These may be selected by first changing the mode, which was not explained in the manual provided with the unit I received. You’ll need to download the revised manual from https://doc.hakko.com and go through the procedure (section 6). Once in the preset mode, pressing the Up button will cycle through the five default presets. The temperature and preset number (P1 through P5) will display alternately. The unit defaults to P3 (750 degrees). The preset temperatures may be altered by holding the Up button while powering up the unit. Press Up to change to the preset you wish to change and then use the manual temperature setting method as described earlier. I plan to leave mine in the normal mode and just set the temperature manually. There are other mode settings, such as password setting, for which I’ll just refer you to the manual. So far, I like it! Street price, about $95. After noticing the continued banter and discussions regarding the use of guard traces in both the EMC and SI discussion forums over the past months, I decided to consult a couple experts on the subject – Howard Johnson and Eric Bogatin. I summarized their thoughts in my latest blog posting on the Test & Measurement World web site: http://www.tmworld.com/blog/The_EMC_Blog/41806-Guard_Traces_Use_Em_or_Not_.php. I invited both to add any additional comment, if they wished. Feel free to add to the discussion. Guard traces are typically grounded at both ends to the signal reference plane. There are certainly situations where guard traces can help. For example, for low-frequency audio – especially for two-sided board designs, guard traces can reduce crosstalk by an order of magnitude. However, on modern-day high-frequency digital designs, guard traces may help, but only if implemented correctly. There’s a great article by SI expert, Howard Johnson, explaining how guard traces work. For more detailed info on the pros and cons of guard traces, please refer to the T&M World link above. While not directly EMC-related, I recently published a review article on Seeed Studio’s fairly new miniature digitizing oscilloscope, the DSO Quad. I first showed this to an interested group of engineers at the 2011 IEEE EMC Symposium in Long Beach during the EMC Consultant’s Toolkit workshop and it drew quite a crowd. 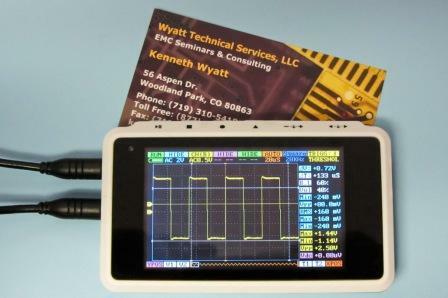 At best, this $199, 3 MHz bandwidth, oscilloscope is quite the conversation piece and I suppose it would work well for low frequency or audio applications. What amazes me is all the functionality built in to this small package. It even includes a built-in function generator. The unit is slightly larger than a standard business card and it comes with two Mueller 10:1, 100-MHz probes with tiny MCX RF coax connectors. The DSO Quad has two analog channels and two digital channels. The sampling rate is 72 Msamples/s. I measured a bandwidth of about 3 MHz. The vertical scale is adjustable from 20 mV/div to 10 V/div (8-bit resolution) and the horizontal sensitivity is 0.1 µs/div to 1s/div. Input coupling is AC or DC and triggering is Auto, Normal, and Single. There are several trigger modes: rising/falling edge, pulse width, and level.